View the Exhibit and examine the data in the PROMOTIONS table. 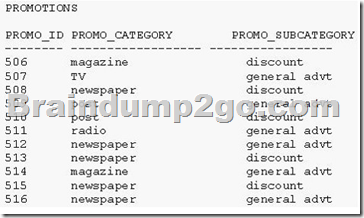 You need to display all promo categories that do not have ‘discount’ in their subcategory. View the Exhibit and examine the structure of the CUSTOMERS and CUST_HISTORY tables. The CUSTOMERS table contains the current location of all currently active customers. The CUST_HISTORY table stores historical details relating to any changes in the location of all current as well as previous customers who are no longer active with the company. You need to find those customers who have never changed their address. Which SET operator would you use to get the required output? Which statement is true regarding the UNION operator? The SQL UNION query allows you to combine the result sets of two or more SQL SELECT statements. It removes duplicate rows between the various SELECT statements. Each SQL SELECT statement within the UNION query must have the same number of fields in the result sets with similar data types. View the Exhibits and examine the structures of the PRODUCTS and SALES tables. View the Exhibit and evaluate structures of the SALES, PRODUCTS, and COSTS tables. Which statement is true regarding the above compound query? B. It shows products that were sold and have a cost recorded. C. It shows products that were sold but have no cost recorded. D. It shows products that have a cost recorded irrespective of sales. A. It executes successfully and displays rows in the descending order of PROMO_CATEGORY. query-that is, with the last SELECT statement. The ORDER BY clause can appear only once at the end of the compound query. Component queries cannot have individual ORDER BY clauses. The ORDER BY clause recognizes only the columns of the first SELECT query. By default, the first column of the first SELECT query is used to sort the output in an ascending order. – The ORDER BY clause can appear only once at the end of the compound query. – Component queries cannot have individual ORDER BY clauses. – The ORDER BY clause recognizes only the columns of the first SELECT query. – By default, the first column of the first SELECT query is used to sort the output in an ascending order. View the Exhibit and examine the structure of the ORDERS and CUSTOMERS tables. A. It locks all the rows that satisfy the condition in the statement. B. It locks only the columns that satisfy the condition in both the tables. C. The locks are released only when a COMMIT or ROLLBACK is issued. D. The locks are released after a DML statement is executed on the locked rows. Locks the rows in the EMPLOYEES table where job_id is SA_REP. Lock is released only when you issue a ROLLBACK or a COMMIT. A. It locks only the columns specified in the SELECT list. B. It locks the rows that satisfy the condition in the SELECT statement. C. It can be used only in SELECT statements that are based on a single table. 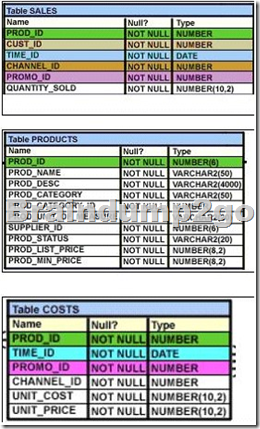 D. It can be used in SELECT statements that are based on a single or multiple tables. Locks the rows in the EMPLOYEES table where job_id is SA_REP. Lock is released only when you issue a ROLLBACK or a COMMIT. If the SELECT statement attempts to lock a row that is locked by another user, the database waits until the row is available, and then returns the results of the SELECT statement. 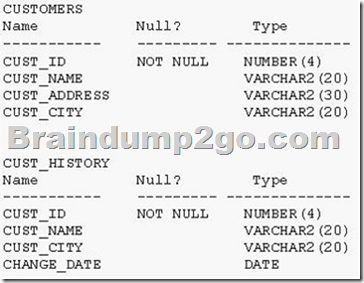 When you issue a SELECT statement against the database to query some records, no locks are placed on the selected rows. In general, this is required because the number of records locked at any given time is (by default) kept to the absolute minimum: only those records that have been changed but not yet committed are locked. Even then, others will be able to read those records as they appeared before the change (the “before image” of the data). There are times, however, when you may want to lock a set of records even before you change them in your program. Oracle offers the FOR UPDATE clause of the SELECT statement to perform this locking. When you issue a SELECT…FOR UPDATE statement, the relational database management system (RDBMS) automatically obtains exclusive row-level locks on all the rows identified by the SELECT statement, thereby holding the records “for your changes only.” No one else will be able to change any of these records until you perform a ROLLBACK or a COMMIT. You can append the optional keyword NOWAIT to the FOR UPDATE clause to tell the Oracle server not to wait if the table has been locked by another user. In this case, control will be returned immediately to your program or to your SQL Developer environment so that you can perform other work, or simply wait for a period of time before trying again. Without the NOWAIT clause, your process will block until the table is available, when the locks are released by the other user through the issue of a COMMIT or a ROLLBACK command. 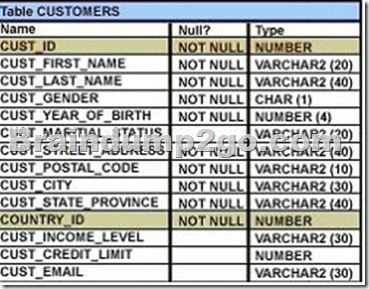 NEW_CUSTOMERS is a new table with the columns CUST_ID, CUST_NAME and CUST_CITY that have the same data types and size as the corresponding columns in the CUSTOMERS table. The INSERT statement fails when executed. What could be the reason? A. The VALUES clause cannot be used in an INSERT with a subquery. B. Column names in the NEW_CUSTOMERS and CUSTOMERS tables do not match. C. The WHERE clause cannot be used in a subquery embedded in an INSERT statement. of columns in the CUSTOMERS table. Do not use the VALUES clause. 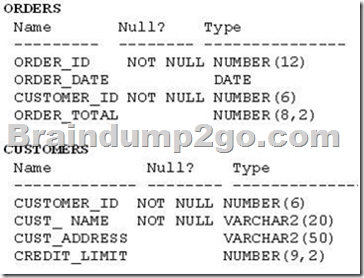 Match the number of columns in the INSERT clause to those in the subquery. Inserts all the rows returned by the subquery in the table, sales_reps.